A surgeon scrutinizes a three-dimensional real-time representation of her patient’s knee on a video screen. She decides which diseased areas need to be excised, and exactly where the robotic arm should be positioned to remove tissue and resurface the knee. Then she manipulates the arm to carry out the surgery, with significantly greater precision than any surgeon would be able to accomplish on her own. This robotic knee surgery is the brainchild of Mako Surgical Corporation, a Ft. Lauderdale, FL -based medical device company. It’s one of many advances in robotics that companies and research institutions in Florida are making in areas that include the life sciences and defense industries. Many industries, including makers of pharmaceuticals and medical devices, now utilize robots. According to the Robotics Industries Association, the use of industrial robotics grew rapidly in 2010, particularly in the life sciences, where it jumped 54 percent. The expansion is presenting opportunities for manufacturers, technology companies, and research institutions. Robotic machines are revolutionizing biology research, says Layton Smith, director of drug discovery at Sanford-Burnham Medical Research Institute in Orlando, FL. 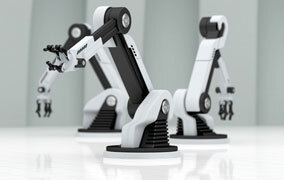 Industrial robots reached maturity just as researchers were delving into genomics and related fields. The Sanford-Burnham robot’s yellow arm can manipulate tiny test tubes, as many as 1,536 to a plate, and move them rapidly through screening processes. “Our robot automates experiments and can screen anywhere from a hundred thousand to even up to a million compounds in 24 hours,” says Peter Hodder, a scientific director of the Translational Research Institute at Scripps Florida. Scripps and Sanford-Burnham own two of only four such NIH-funded robotic screening platforms in the country. Both labs have recently seen successes thanks to robotic assistance. Smith’s lab at Sanford-Burnham has teased out the role of a particular protein in heart disease, a protein he considers a potential target for drug therapy. And Scripps is the first center in the country to have developed a compound using this screening technique that is in clinical trials for treatment of multiple sclerosis. Both advances offer the potential for future spinoffs to commercialize the research. An unforeseen obstacle on the floor could send a two-legged robot toppling over. Unlike humans, robots cannot feel the forces the terrain underfoot exerts on their joints and limbs and make the corrections to stay upright. This phenomenon is of particular interest to the military, which sees potential in robot scouts and robot-assisted rescue and is funding research at Florida institutions to solve such challenges. To solve the toppling problem, the robotics group at the Florida Institute for Human and Machine Cognition, a university-affiliated research institute based in Pensacola and Ocala, FL, is focusing on force control and push recovery. According to Ken Ford, IHMC founder and CEO, researchers have developed a bipedal robot that can stand on one leg and thrust its other leg out to steady itself when pushed. They’re now working on applying the same techniques to the robot so that it can recover from a stumble while walking. Every few years, huge military or cruise ships undergo overhauls of their external coatings of paint and anti-corrosive and anti-fouling agents. Traditionally this is done by sandblasting, which is both labor intensive and a threat to the health of the workers and the environment, since huge clouds of chemical dust can settle all over the shipyard. Responding to this challenge, Chariot Robotics, based in Palm City, FL, is selling robots that can scurry over a ship’s surface, blasting away at its coatings with ultrahigh- pressure jets of water and sucking the fouled water and the coatings back up. Chariot Robotics’ Envirobot can strip a ship ten times faster than human workers with spray guns, with higher precision and a significantly cleaner end result. New technologies will soon make it possible to sequence thousands of human genomes. Now comes the hard part: understanding all the data. A genomics pioneer's sequencing machine comes to market. Brain trauma among soldiers, a $5,000 genome, cellular switches, and insight into the brain's beauty. It may have arrived for real this month with a largely bureaucratic announcement by a government agency. Learn how robotics are moving the life sciences field forward and addressing some major challenges for the military. Download a 12-page overview on Florida's Life Science Cluster, including size and location of the biotechnology, pharmaceutical, medical device, and health care industries in the state. Genetic profiling can provide information on what diseases may befall us. And knowledge of an individual’s genetic makeup may also help scientists figure out how to treat diseases—part of an emerging field known as personalized medicine.